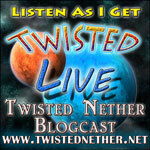 I will be a guest on this Saturday's episode of the Twisted Nether Blogcast at 8 PM PST (11 PM EST). Stop on by and enjoy the show! To listen to the live stream, go to twistednether.net/live and join in the chat room. See you there! while Melbourne is 1 PM Sunday. Couldn't catch you live, Red, but I'll check it out when it's up for download! Really loved your commentary on gaming in general (I hope I'll have children interested in roleplay one day!) and WoW in specific. Yeah, I sound normal; it's that Midwestern accent peeking through. My wife (and everyone else) will tell you that my voice carries, however.